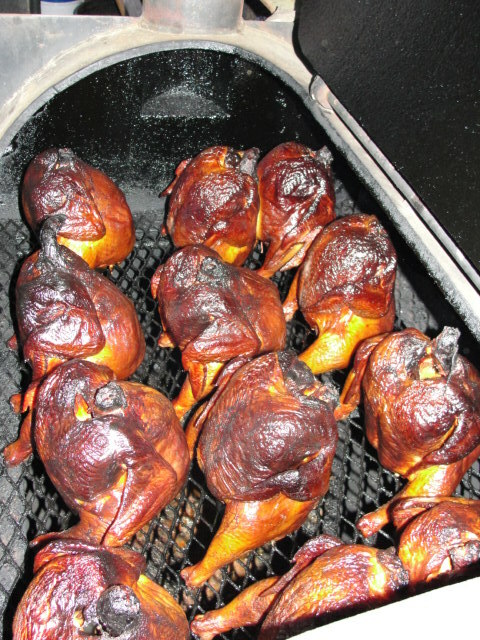 After 9am church with mom this morning, I came back home to fire the pit and start the chickens. These birds have a beer can stuck in their cavity. No I don’t use 12 beers. I use one beer for three birds. They started cooking about 10am and I removed them from the pit about 6:30pm. Hopefully they are fully cooked. However warming them when ready to eat, should have them fully cooked. CHECK OUT LUKIE’S NOSE AND HEAD. 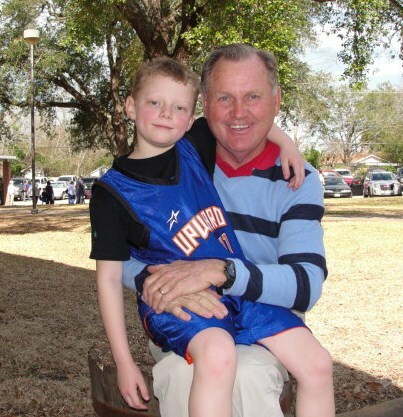 His dad sezs Lukie skidded head first on some payment while running. Lukie sezs it ‘don’t hurt’. Brett played a good defensive game today. 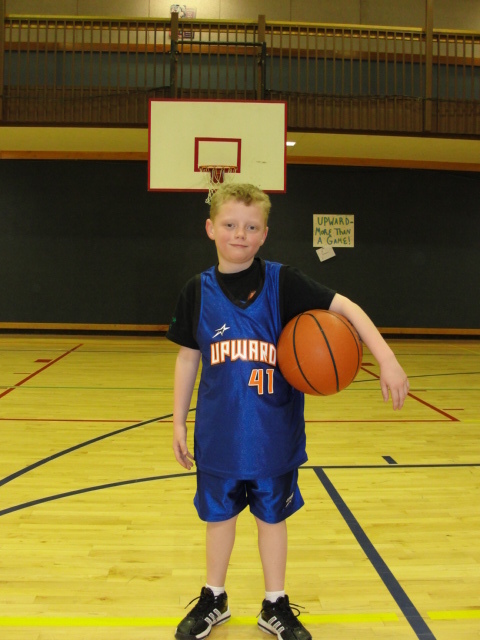 He blocked several shots and had several steals. And in his last game, it appeared that he had decided to pass the ball to teammates rather than take as many shots as previous game. In the top photo he was retrieving a rebound. In the next photo, he was driving for a lay up which he made a good bank shot. 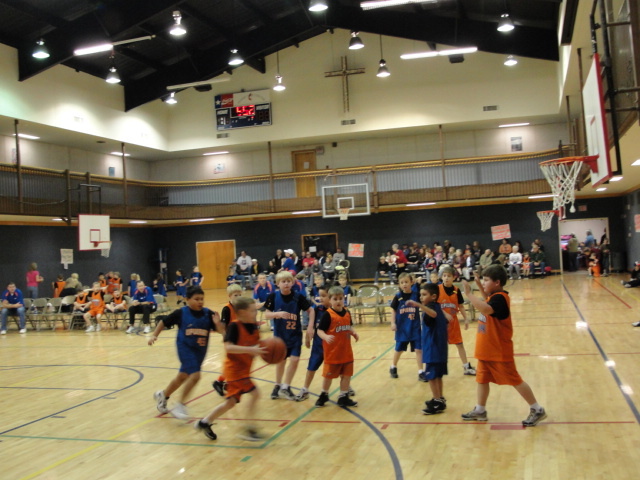 I got to the Methodist Church Gym about 30 minutes before the start of Brett’s game. The games at the church start at 8am and continue til after lunch. The 8am games were a bunch of girls and boys about five years of age. It was hilarious to watch these little guys having so much fun. 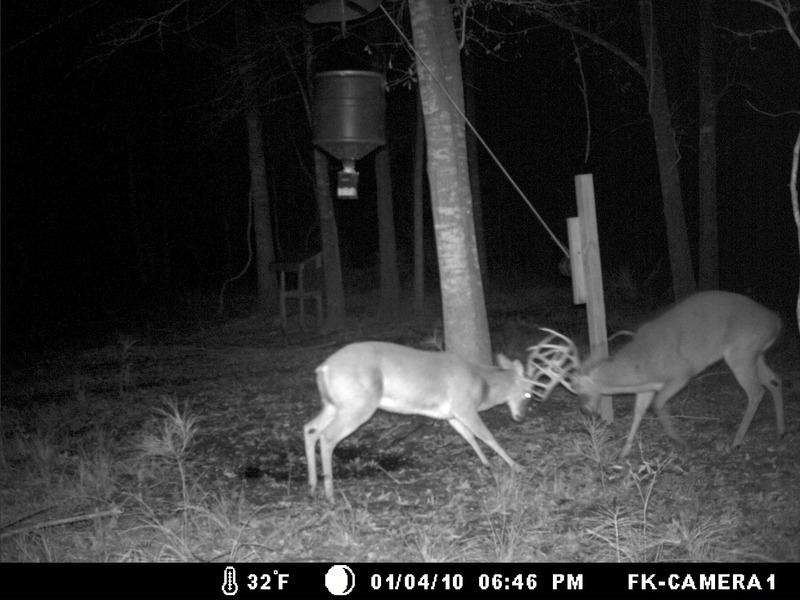 During the last deer season, our game camera was constantly taking photos of two nice 10 point bucks. 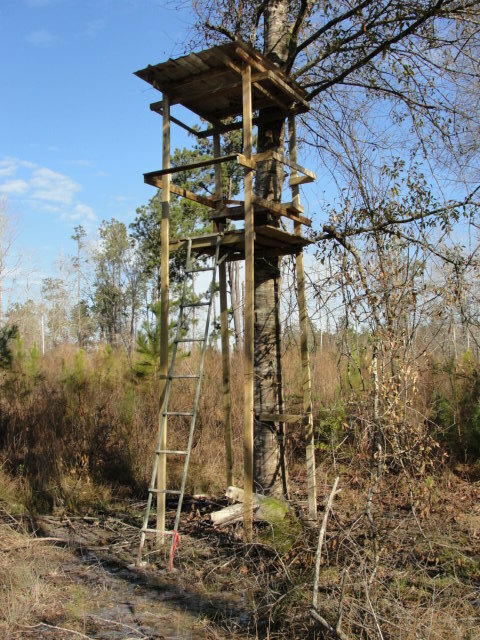 So after season, I started building a tall deer stand to be used for archery hunting. 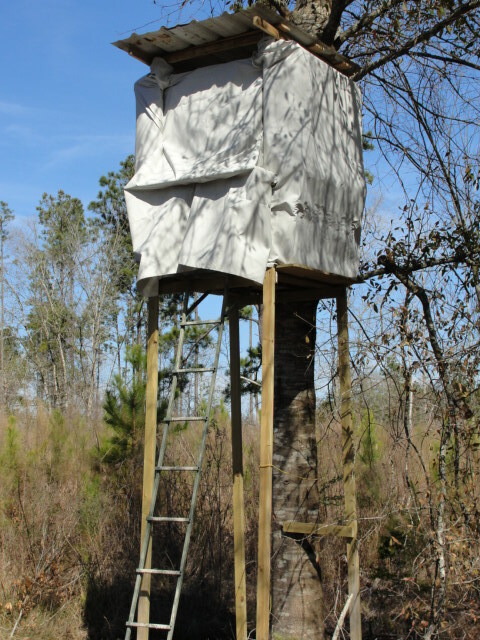 The interior is 4′ X 5′ which is plenty room for two hunters. It has great visibility overlooking a year round corn feeder. It is about 20 yards from the feeder. I’ve yet to cut the shooting holes in the exterior fabric. Here is one photo of the ten pointers trying to settle a misunderstanding. I’m hoping the Garrett or Brett will get a chance at one of these 10 pointers during the next season.. And don’t rule out KJ or Spiffy sitting with me with a camera or gun. A COUPLE DAYS AGO, I CAUGHT THIS BIG MOMMA! Today was the time to clean this gal. 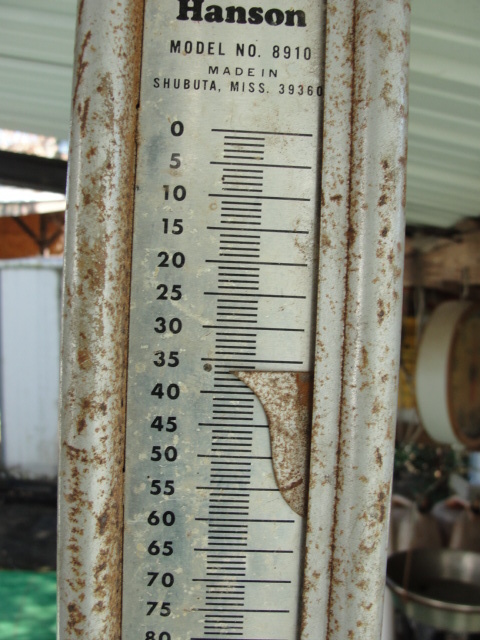 But first I wanted to know just how big she was and the scales do not lie–37#. It took me about 30 minutes to clean her. She had a lots of fat and red meat that had to be removed. I’ll soak her in cold water for couple days. 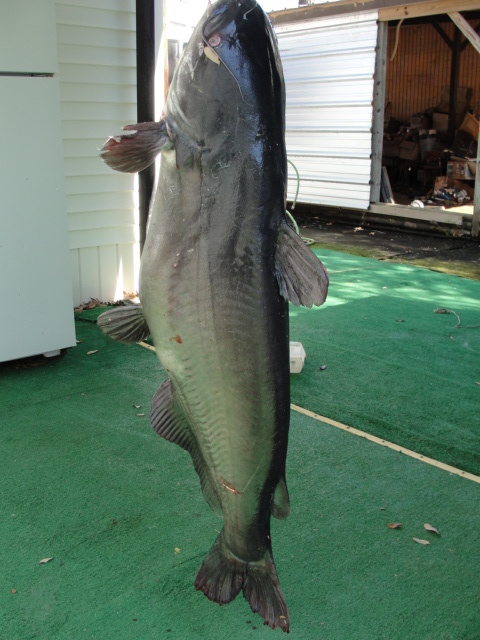 A lot of folks think these big fish are not good to eat. After soaking for a couple days, her meat will be lilly white. Before packaging, I’ll check to be sure all red meat and fat have been removed. When it is time to cook her, the meat should be cut into small thin pieces. I promise the meat will be outstanding. 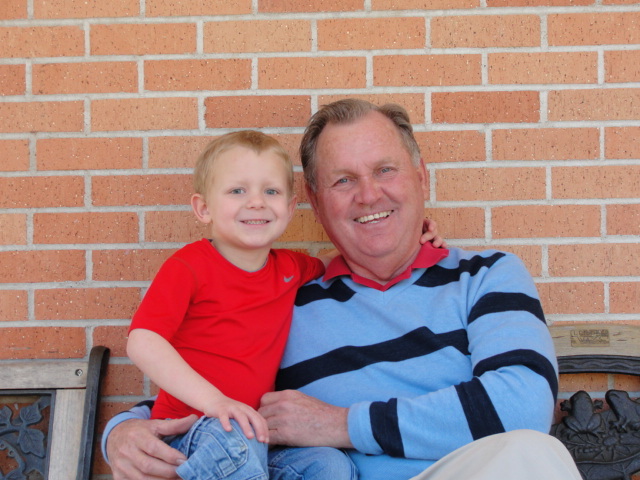 And I’ve got grand kids that love my fish. 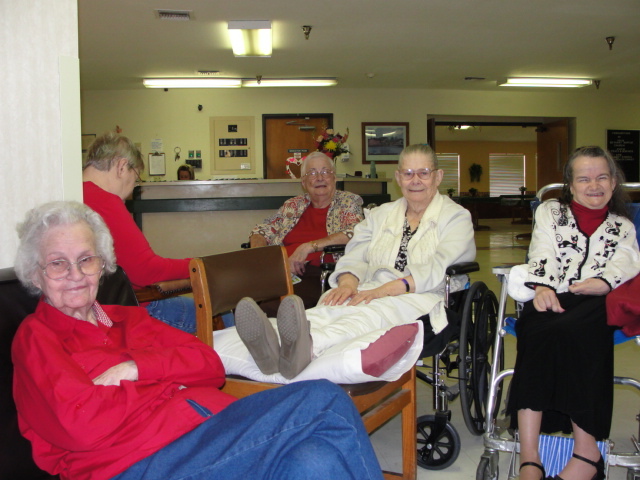 These gals(mother, Angie, Frances, Nannie Poindexter and Mary) sit at the front door and nothing gets by them. Mary (far right) gets a kiss from everyone that enters. All of these girls are loved, but Mary is special to the community. And do not make a mistake and sit in one of these spots because you will be ask in a very firm tone, MOVE . The bad thing about their location is they get a blast of cold air when the front door is open. It’s never a dull moment when these gals gather. 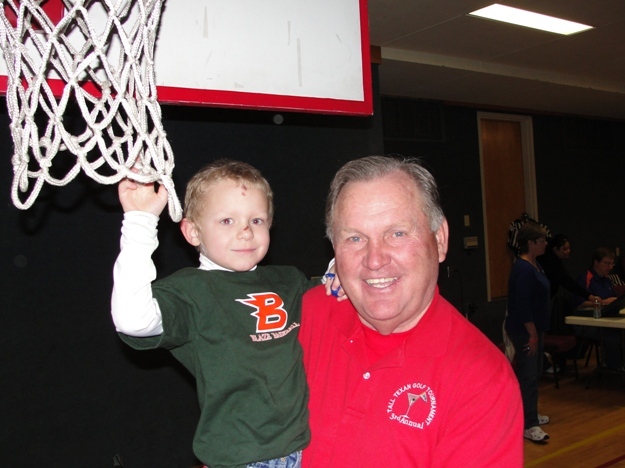 I don’t how big he was, but I was straining to hold him up! I had baited my jugs yesterday afternoon with deer liver as I can’t catch perch in my perch traps due to the cold water. The deer liver was from a doe deer that my grandson Garrett had killed. It stopped sleeting around noon, so I decided to check the jugs. I have 11 jugs out and checked 10 of them without a fish. One jug was missing. In the distance, I got a glance of it as it surface and immediately disappeared underwater. The sleet had returned and I needed to get back to the house. This guy was on the top hook just five feet under the water surface and he was green (had just got hooked). 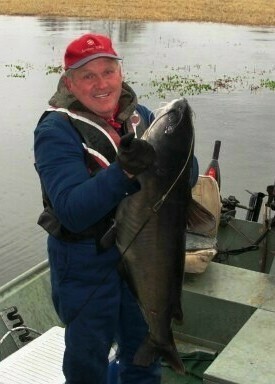 I could catch the jug but had to let go several times otherwise he might have pulled the hook out or broke the line. Dad had taught me that on big fish you should raise and lower them seven times. Then they would be too tired to fight. Finally, he got too tired to fight but would not fit into my net. With gloves on, I tried to put my hands in his gill and no luck. You do not put you hands into a large blue cat’s mouth. I then took a gaff and ease it into him mouth. With one motion, I jerked the gaff into the side of his head and rolled him into the boat. He is now swimming in my fish box. In a couple days, I’ll weigh him before cleaning him. I’m guessing he weighs around 35 pounds. As previously posted, we really have a great golfing group of good friends. Today was a cold and windy and only two us braved the conditions. So it was me against James and I kicked him around pretty good. Did I show any love, compassion, or understanding just because it was his 91st birthday? Nope, I told him to take his depression medication and get ready for a whipping. 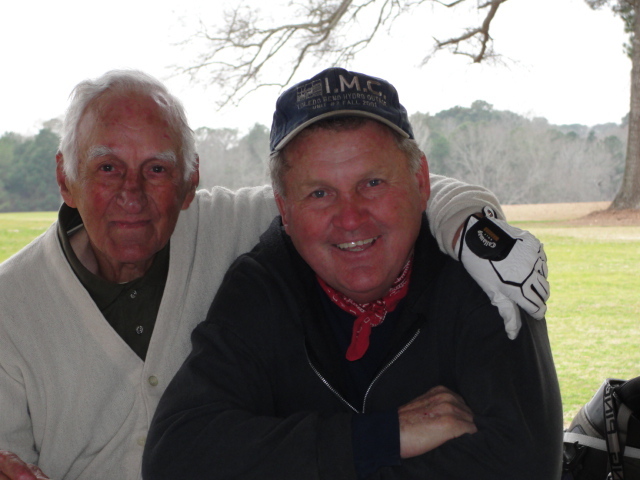 Age 91 and still playing a darn good game of golf. 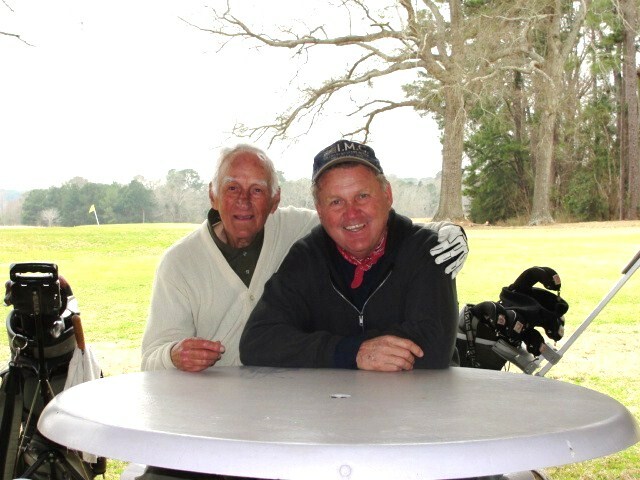 He attributes his health to walking the par 3 Pendleton Harbor Golf Course three times a week and he is appreciative of Pendleton Harbor Property Owners for allowing non residents to enjoy their golf course. He doesn’t play on Saturdays as that is the day he and his chick goes dancing. They try not to miss a song. Happy Birthday James and I hope to see you Wednesday, so get your depression medication ready. Behind our old home, we kept about 20 acres of land. Of the acreage, about five acres is cleared with just a few scattered live oak trees. The hogs have been having a field day, rutting at their leisure. We had tried to keep acreage mowed at least twice per year. Anyway, it just got to be a hassle keeping it mowed and fighting the hogs. So I decided to plant the open area in pine trees. It’s just about the end of planting season and we were fortunate to get some seedlings. 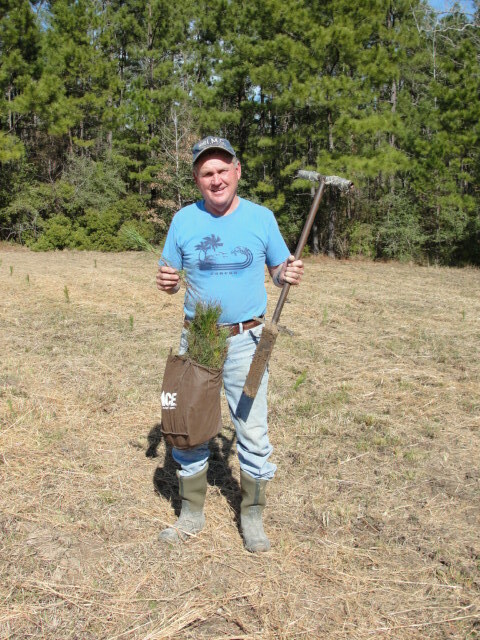 We obtained 1,000 genetically improved loblolly pine seedlings. I will/am hand planting these pine trees using a dibble. I can plant about 100 seedlings per hour. At this time, I’ve planted 17 rows with 16 seedlings per row based on a 6 X 9 foot spacing. 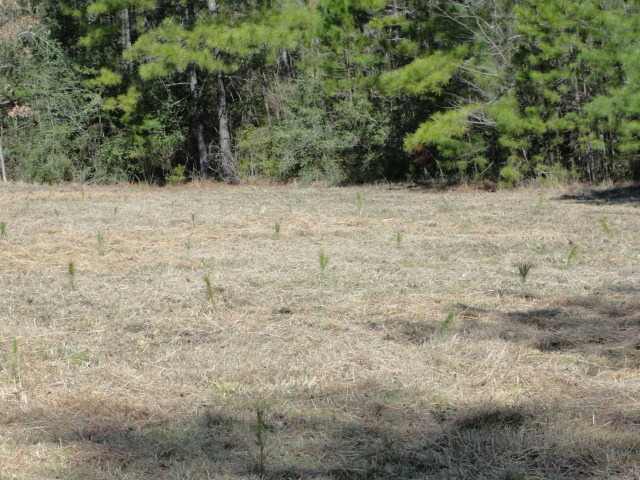 Assuming a good survival rate on the seedlings, the pine plantation should be ready for a commercial thinning in 10 to 12 years. In 25 years, the trees should be ready to harvest as pine sawtimber and the area ready to be replanted. HOGS TAKE THAT! 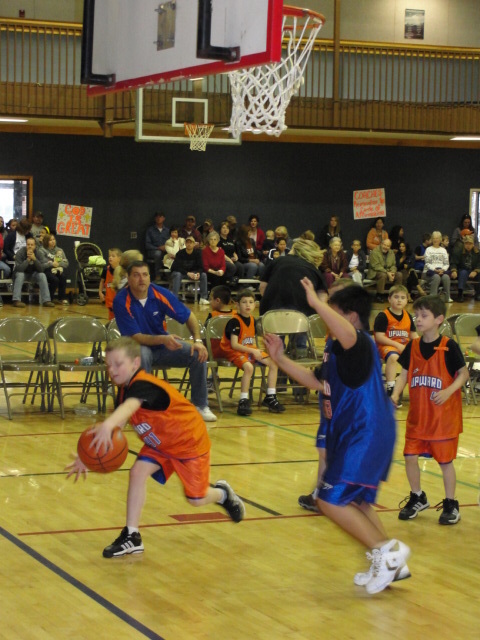 Brett plays basketball in a church league and the games are normally on Saturday morning. It’s an interesting game in that they do not keep score, nor do the call fouls or double dribbling. The kids have a great time and it is fun to watch. Lukie was sick yesterday. Today, he was hitting on all cylinders.